I want to share with you how I made my sister’s beach cake for her birthday last week. I started planning for this around three weeks ago and couldn’t decide if I should make her a travel or beach related cake. She likes to travel and just had an Asian tour. She also has a Maldives trip planned after her stopover here in Singapore to celebrate her birthday, thus, the beach cake idea. 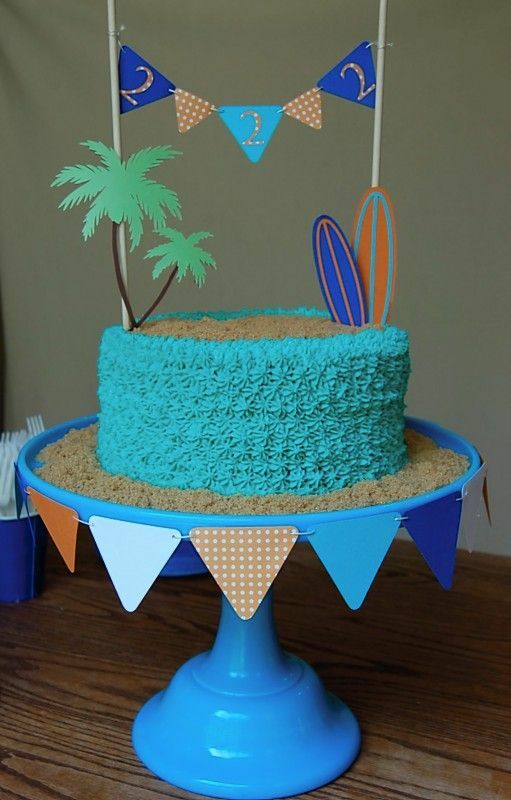 After browsing through Pinterest, I settled on making her a beach cake. There were a lot of cool ideas in Pinterest and if you’re interested, here’s the board I made for inspiration. I have great plans for this cake…at first, I planned on making a lemon cake for her to go with the beach theme but ended up making a layered Chocolate Cake with Swiss Meringue Buttercream instead. A friend asked if I could help make her son a Minecraft cake for the next day and I don’t want to tire myself out too much. It’s easier for me to do a tried and tested cake for both to avoid stress. For decorations, I made some shells, picnic mat, towel, flip-flops and coconut. I also made a tree for her but it cracked and the trunk broke before I even started painting it. Good thing I had a back-up plan of making a name banner for her. I watched a few youtube tutorials prior to making the cake and here are the video’s that I found most useful. The tree I made was inspired by this video and although it was a disaster, it’s a very good idea. I plan to take note and use for future projects. Since I have no seashell mold, I made my shells using this video for reference. They didn’t come out too well though since it came out too white. In the end, we just drizzled some sand on top to make it blend in and not seem too unnatural. My idea for the sides of the cake originally came from the picture below but my icing was melting while doing the second row. I had to scrape it off and and just did a wave-looking messy look. Too bad I didn’t make the sides taller, like the video on top, to make it look like waves. I find doing the flip-flops the hardest…I tried a few times and they really don’t look too well. On my third attempt, I used the Wilton’s leaf cutter to cut out the shape and used some of the ideas I found in Youtube for the strap. Although it’s the third attempt, you can see that it still needs a lot of work and practice! :) The towels were a lot of fun to do and the coconut was also easy. I originally thought that I’ll have a hard time making it but turned out that the flip-flops were the hardest. My sister was very happy with her cake and everyone loved my chocolate cake…I hope!!! I planned to use Nutella SMBC again for filling but my other cousin discouraged me (turned out that she just hates all icing) and since I’m also tired, relented without a fight. Recipes used were the same chocolate cake and swiss meringue buttercream from Heatwave cake; I just omitted the Nutella for the buttercream. Experiment with SMBC…try high humidity recipe from craftsy class. SMBC was a little difficult to color…prior to cake decorating, please research on how to get desired colors and color icing at least 30 minutes before use. Turned out that I don’t just use blue to make blue…had to add a few drops of other color as it turned out grayish at first. The nice shade of blue was only visible around 30 minutes after.